Biomechanical term for the whip–like movement is the kinetic chain: the sequential flow of energy and momentum from bigger segments to smaller ones. 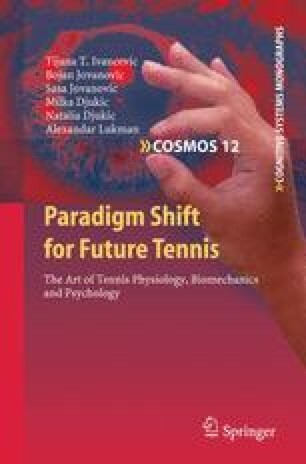 Tennis requires sequenced activation of muscles and movement of bones and joints to achieve the motions, positions, and velocities seen in a player. This sequencing is known as the kinetic chain. Kinetic energy and momentum, as well as muscular power, are developed from the legs, hips and trunk muscles and transferred to the arm muscles. This allows the energy, momentum and power to be transferred efficiently to the hands, moving the racquet-head with maximum speed to the ball.